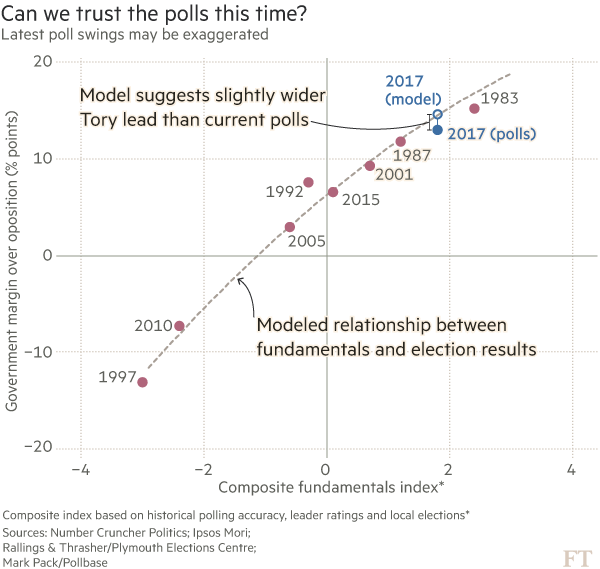 In today’s FT I give details of my analysis of polling and fundamentals ahead of the general election. Based on historical accuracy, leader ratings and local election results, the likeliest outcome as of now is a Conservative popular vote margin in the mid-teens. I’ve also written a comment piece which, for the first time, goes into the detail of the back story. I explain what made me suspicious that there was a problem, how I set about investigating and proving it, and how a lot of it had uncanny parallels with things I encountered during my time in the city. I also stopped by with Keiran Pedley and Leo Barasi to record an episode of Polling Matters where I go into some more detail about the models and we discuss the recent trends. I’m not sure what will happen with regard to polls post-Manchester. I know that at least some have been in the field, though I’m not sure whether they’ll be published or not.